The bigeyes from the Priacanthidae family are avid nocturnal predators. It accounts for their big eyes. They are equipped with pretty large mouths. Just like the soldierfish and squirrelfish, bigeyes like to shelter in cracks and caves and crevices of coral formations. They go ‘pelagic’ when they chase their zooplankton for food in the open sea. The cardinalfishes belong to a family called the Apogonidae. They are relatively small, reaching 10 centimeters only and have what is called an ‘elongate’ body. 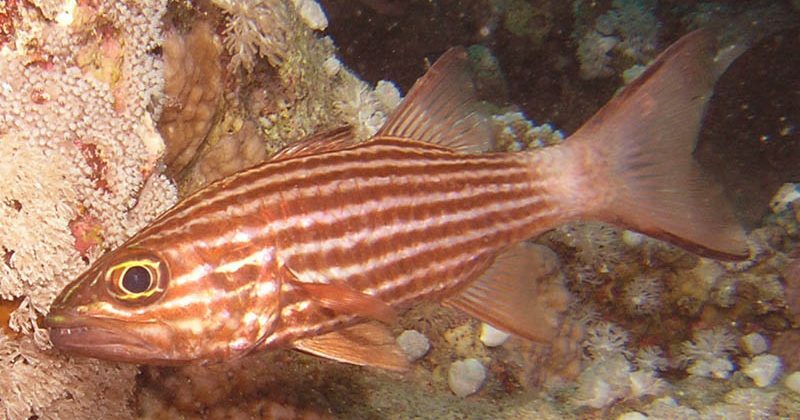 Like the soldierfish, the squirrelfish and the bigeyes from the Priacanthidae family, they have big eyes to suit their nocturnal hunting demands like zooplankton in pelagic area’s. During the day cardinalfishes like to rest under coral branches. After female cardinals have produced their eggs in their thousands, they are being fertilized by their male counterparts. After this process males carry and guard the eggs in their mouth until hatching occurs one week later. One of the common bigeye’s features is its reddish brown colour on a compressed body, not exceeding 40 centimeters in length. They likes caves at depths from 8 to a staggering 250 meters deep down the abyss. When they hide during the day in crevices they do so in relatively large groups. On their menu are crustaceans, tiny fish and so-called cephalopods. The eyeshadow cardinalfish derives its funny name from its coloured head pattern. There’s a black band or bar running from the tail to the mouth, covering the eyes like the mask of Zorro. They measure up to a mere 10 centimeters and feel at home at depths ranging from 2 to 40 meters. It’s a very shy species and easily intimidated. It feeds on small fis hand invertebrates. During the day you will find this cardinalfish hidden under ledges or in cracks and crevices to avoid bright light. When they became vividly active they disperse over coral formations at night to feed on crustaceans. It can reach a maximum size of 13 centimeters in length and roams around between 2 and 40 meters. The flower cardinalfish is a species of cardinalfish with a coppery-coloured pattern. It’s a mouth brooder with a black bar around its tail and with proportionally large eyes, growing up to 12 centimeters. They are found between depths of 1 to 30 meters.